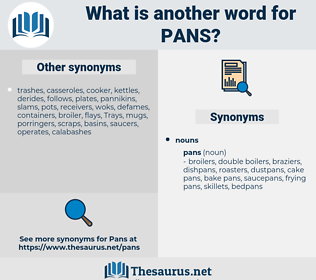 What is another word for pans? 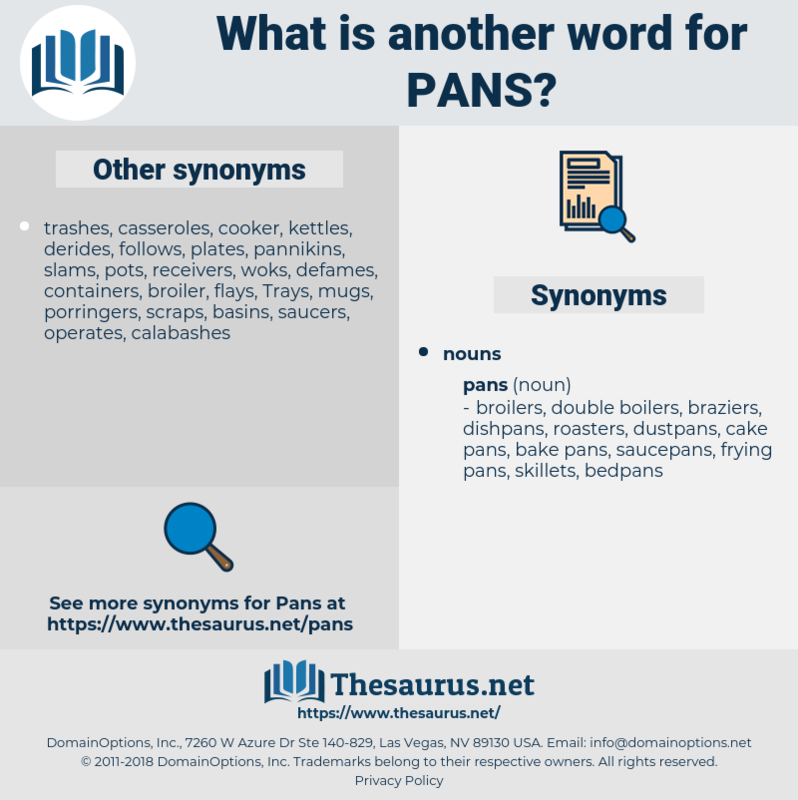 NPAS, parts, pads, casseroles, receptacles, highlands, platters, skeletons, provers, Breads, kitchens, pots, bowls, ferry-boats, portions, ways, watchers, CPAS, uplands, dishes, basins, Galleys, potholes, pieces, cookers, dinners, stoves, segments, pools, tanks, Trays, displays, moulds, BACS, toilets, housings, sections, Shelves, cooks, bins, hollows, swathes, WCS, buckets, vessels, walls, cups, molds, sectors, tops, tracts, flats, Boxes, Ferries, TOTES, chunks, tubs, decks, blocks, sets, hills, cars, sides, LINEs, dashboards. criticizes, criticises, raps, condemns, blasts, slams, lashes, stoves. The drinking pans are filled at each feeding time but at no other time. On the other side, a row of shelves contained a number of pans of milk.